Hello spring! And hello amphibians! Frogs are in their power in or near water, and have the amazing ability to nuzzle under the mud and hibernate all winter long.We are greeted with their calls and the nostalgia of seasons past as spring warms up and the amphibian world gets hoppin’, so to speak. Frogs were not ignored nor spurned by the ancient ones. In Ancient Egypt, Heqet was a frog goddess associated with the life force essence and the abundant wetness of the Nile’s yearly floods and the sprouting of new corn. Because of their associations with fertility, they have been interpreted as signs of abundance and coming wealth in many cultures. 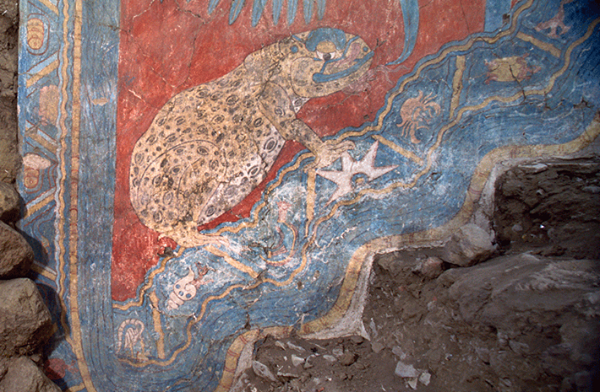 The Maya saw frogs as the denizens of Chaac – the long nosed, wily rain god often cuadri-present at the four corners of the earth, sustaining the rain bearing heavens. The modern Maya still re-enact this arrangement in the traditional Ch’a Chaac ceremony to bring first rains to the milpa, or poly-culture corn field. Frogs are seen as being able to move between our world and the underworld in many cultures. They are also indicators of a clean environment – where there are frogs, there are likely to be few environmental toxins. 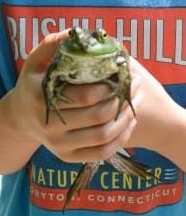 Those with a frog totem should seek to diminish toxins in their surroundings and stay close to water. Frog totem also calls you to purify your body and to remember that the skin is an organ which is a huge part of any detoxification (or toxification) processes. Frogs shed their skin and are a sign of coming personal change, renewal, and transformation. Some frogs are also able to change colors to match their surroundings, adding a chromatic element to their shapeshifting powers. Frogs are in their greatest power in the spring, summer, and fall times. They use vibration to call one another and to control the weather. The frog calls on us to use vibration, to sing and chant rhythmically, and to work with the elements and the winds to be in harmony with weather patterns. Frogs have acute vision and very magical eyes. They trap flies and other bugs from a great distance with a well-aimed blow with that tacky tongue of theirs. This imbues those with a frog totem with precision and vision. The frog’s ability to jump and stick onto just about anything, still or moving, speaks to their great acrobatic adaptability and spatial sensitivities. Frogs are not afraid to aim and fire – not for food and not for putting their whole beings on the line to move in a direction decisively. Use the frog to help you to make decisions and JUMP!